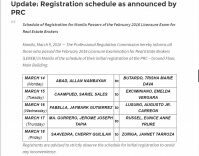 The long wait is over, the Professional Regulation Commission or PRC has just released the official PRC Licensure Exam Schedules for 2012 at their website and it includes the licensure exam schedules for Real Estate Brokers, Real Estate Appraisers, and Real Estate Consultants. 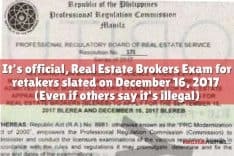 Actually, I’ve been hearing a lot of “rumors” pertaining to the date for the next real estate brokers licensure exam since a few months back, from very reliable sources. However, no official announcements followed, which is why I referred to them as “rumors”. 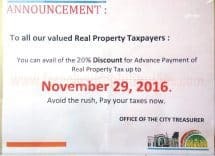 Because of this, I decided that I would rather wait and only post the official date of the Real Estate Brokers Exam for 2012 from the PRC. Now it’s official and you may find the complete 2012 licensure exam schedules for real estate professionals below. 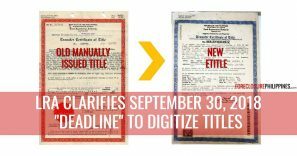 What are the real estate brokers licensure exam requirements? What is the coverage of the Real Estate Brokers Exam? Any other subjects as may be determined by the Board. So where can you find those accredited service providers where you can get at least one hundred twenty (120) credit units of real estate subjects and training? To help you out, I will be making another compilation of CRESAR/CRESAT/REBSAT (or whatever it really is called 🙂 ) schedules of accredited service providers similar to my previous compilation for the March 2011 Real Estate Brokers exam. I invite everyone out there to submit schedules of seminars you may know, along with other important details like seminar fees, exact address of venue, complete schedule, etc, by leaving a comment below. How can I file my application for the real estate brokers exam? Once you complete all your requirements, I suggest you file your real estate brokers exam application early. My wife created a step by step how-to on this which you can find in the article below. Although this was written for the past exam (March 2011), I believe this should still be applicable for the coming real estate brokers exam on March 18, 2012. Keep in mind that the deadline for the filing of applications is on February 27, 2012. Where will be the exact venues of the Real Estate Brokers Exam on March 18, 2012? 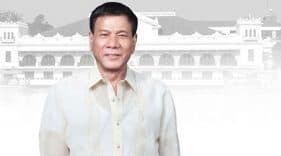 I expect the PRC to announce the final room assignments a few days before the exams similar to what they did in the past. For the March 27, 2011 exam, I believe they released the room assignments 5 days before the exam, and I also posted the room assignments here. 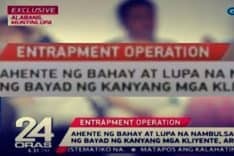 Once this is released by the PRC for the coming exam on March 18, 2012, I will also post it here once again. I highly suggest that you subscribe to e-mail alerts so that you will be notified once the final room assignments become available. Lastly, good luck to all aspiring real estate brokers who will take the licensure exam on March 18, 2012!